Eerdword, the Eerdman's blog just posted something by Joy Schroeder on her book The Book of Genesis, a new volume in The Bible in Medieval Tradition series. Schroeder has translated major excerpts from seven different medieval Christian commentators on the Book of Genesis, many (most?) of which have not been published in English translation before. Be sure to check out her post by clicking here, and consider buying the book! It appears to be available in Kindle edition now and paperback at the end of the month. 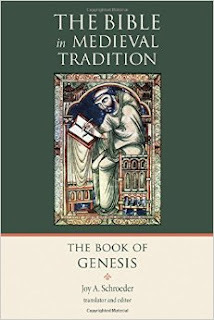 As someone who studies the interpretation of Genesis in ancient Judaism, I am very excited to take a look at this resource and get a better sense of how the book was interpreted by medieval Christians. The history of interpretation is fascinating in its own right, but it also gives us important and often revealing insights into our own modern assumptions about text, meaning, and interpretation. Inheriting Abraham: The Legacy of the Patriarch in Judaism, Christianity, and Islam, by Jon D. Levenson. The Bible as it Was, by James Kugel. In Potiphar's House: The Interpretive Life of Biblical Texts, by James Kugel. Old stuff is exciting! Journeying into the ancient past we find worlds that are both startlingly different from and similar to our own. Such journeys help us know where we've come from and give us insights to make better choices about where we are going. While rewarding, trips to the ancient past are not always easy: they require some intellectual effort and a lot of detective work. The Ancient Bookshelf offers resources and reflections on the ancient world (and some other interesting things), with the hopes that it will both pique your curiosity and help you on your own journeys of exploration. Follow the Ancient Bookshelf by e-mail! "Deformity and Disability in Greece and Rome." Review: "Inheriting Abraham: The Legacy of the Patriarch in Judaism, Christianity, and Islam."